Next Delta launch is scheduled for December, 2006. 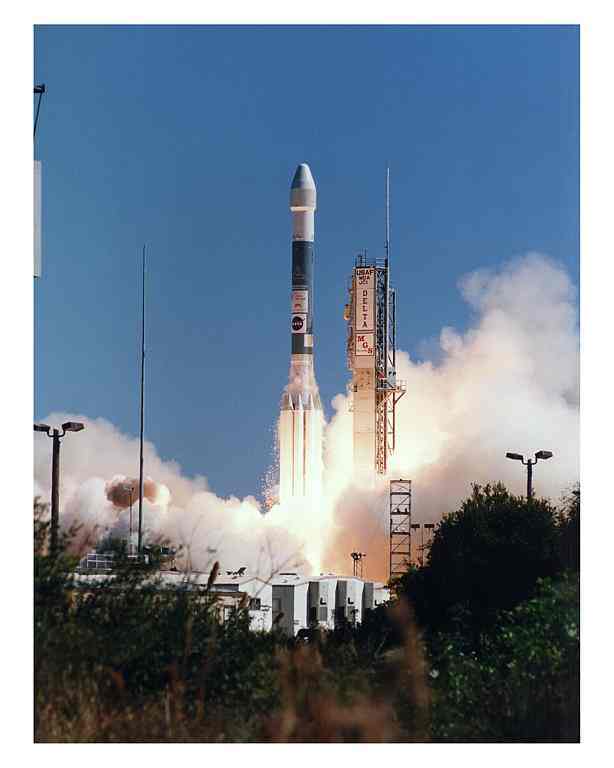 Steve "FoggyMyst" Arriola took this video (4M) of an April 15, 1999 Delta 2/Landsat launch. For the first two minutes of flight, the vehicle is running on its liquid fuel engine and 3 to 6 strap-on solid fuel motors. Solid fuel motors leave a very distinctive contrail. Angelenos should have a very nice view of the flight on the solid rocket motors, and even in San Diego, we should be able to see them for the last 30-45 seconds of their burn. For the remainder of the flight, the vehicle runs on its liquid-fuel engines, and the contrail is much more diffuse. At four minutes into the flight, the first stage drops away and the second stage starts. This staging event is very clearly visible, although the second stage's smaller engine leaves an even less visible trail. With binoculars, you ought to be able to follow the second stage for another minute or two, under good lighting and atmospheric conditions. Under ideal conditions (when launching 30 minutes after sunset), you can actually follow the vehicle all the way to orbit, with good binoculars.